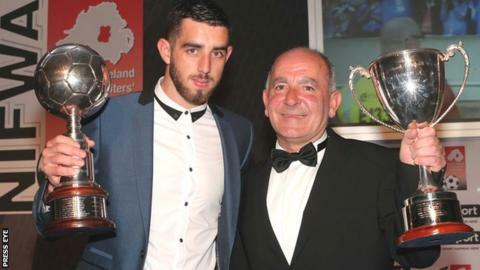 Cliftonville striker Joe Gormley was named the NI Football Writers Player of the Year at the awards ceremony in Belfast on Monday night. The forward scored a club record 37 goals last season to help the Reds secure back-to-back Premiership titles. Cliftonville boss Tommy Breslin won the Manager of the Year award for a second straight year while Glenavon defender Rhys Marshall was top Young Player. Northern Ireland captain Steven Davis secured the international award. David Healy, Northern Ireland's record goalscorer, was inducted into the Dr Malcolm Brodie Hall of Fame. Former Croatia striker Suker was in Belfast to honour Healy, who broke his European Championship qualifying scoring record with 13 goals in the 2008 campaign. Institute's Michael McCrudden was Championship Player of the Year while Ballymena United secretary Don Stirling received the Merit Award. Ballymena side Harryville Homers, who won the Junior Cup, were the non-senior team winners. Gormley also took home the Golden Boot award as the league's top scorer and his latest awards come after he collected the Ulster Footballer of the Year honour last month.